You are here: Home ∼ Italy’s Prosecco Region is Just One Hour from Venice – Did You Know? I conducted an entirely unscientific survey over the festive fizz period of December – I asked everybody with a glass of Prosecco in their hand if they knew that the Prosecco region was just one hour from Venice in Italy. Results: 10o/10o people didn’t know (or some number like that). Prosecco drinker: You can take a Prosecco wine tour from Venice? Prosecco drinker: It’s only an hour away? Prosecco drinker: So, I didn’t need to go on that bl%$dy day trip from Venice to Murano to look at glass? Prosecco drinker: I could have drank Prosecco with vineyard views instead? Prosecco drinker: Why didn’t I know this? Why, when I’d been drinking Prosecco for close to a decade, did I not know where the Prosecco region was? 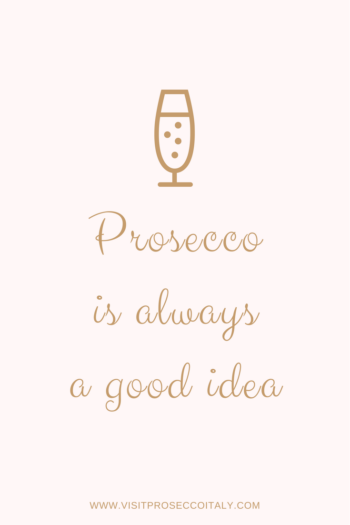 How could the Prosecco there taste so much better than what we get in the supermarkets back home? And cost so much less. Why were the Prosecco wine tours from Venice so expensive? And, could I take my own self-guided Prosecco wine tour from Venice at a lower cost? I’m making no apologies for the fact that it’s pink. Below I’ll give you the what, where, when, how and why of taking a Prosecco wine tour from Venice. If you’re already in the ‘yes, I need to do that’ camp, head over to my Visit Prosecco Italy site. There, you’ll find everything you need to know about visiting the Prosecco region to take a wine tour from Venice. It includes how to get there, where to stay, my favourite foodie spots in the Prosecco region and, most importantly, it lets you get in contact with two local drivers I have met who will help you plan your own wine tour from Venice without paying for an over-priced, under-flexible group tour. I’ve written more than once about the downsides of taking a package Prosecco wine tour from Venice (here and here). Tours can be inflexible. You can end up with a group of people you don’t like. Lunch is usually decided for you and, worst case, you’re forced to chew through a thrown together buffet. But that wasn’t my big problem with the package wine tours of the Prosecco region. And none of this mentions the fact that you’re paying quite a lot of money to spend a couple of hours in a car battling to get off the island of canals, Venice. If you can get yourself on a train in Venice (very easy to do), all you really need is a designated driver, right? The vineyards will talk you through the wine stuff and pour your Prosecco for you. Do you really need an official guide to hold your hand and charge you for the privilege (holding your hair is a different matter, and that job falls to your nearest and dearest)? With 3 people in my group, I couldn’t grasp the idea of throwing down over €600 for a couple of hours of tasting a drink that sells for little more than €10 a bottle. So, after a lot of deliberation over the sparkling stuff, I decided to arrange my own Prosecco wine tour from Venice. On a budget and able to travel with a group of 6 people, you can take a wine tour from Venice to the Prosecco region for under €75 per person. Even as a couple your price will be a fraction of most formal tours out there. That’s it. No extras. No paying for things you don’t want to see, eat or do. You speak to your driver and decide with them what you want to do. You can design your own Prosecco tour on your terms and to your budget. Of course, it’s not all about budget. Want a Michelin star restaurant – there is one in the Prosecco region. Want to add in a gelateria – done. Want to taste excellent cappuccino – absolutely. Want to be picked up at the train station and dropped off at a hotel in the Prosecco region hotel – all included. You can also pay more to get picked up from Venice or, more usefully, have extra Prosecco drinking time…because you’re only in the area once and…well, Prosecco. In fact, I’d recommend spending the night in the Prosecco region where accommodation options are plentiful, rates are cheaper than in Venice and the quality is much higher. Plus: you get to spend the night surrounded by the the beautful Prosecco hills. 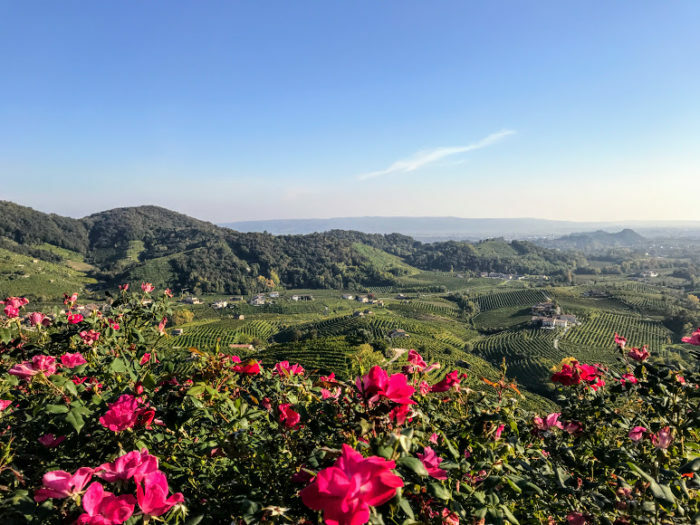 I’ve set up Visit Prosecco Italy to help you plan and book your trip to the Prosecco region without having to scratch together outdated details and pick through subjective reviews from dozens of sites online. 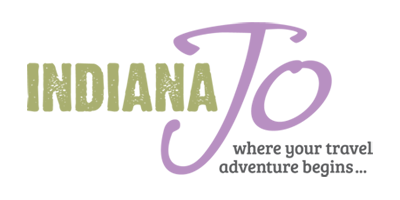 As of January 2018, my Visit Prosecco Italy website is less than a month old and while I have all the basics on there, I’ll be adding new content weekly. 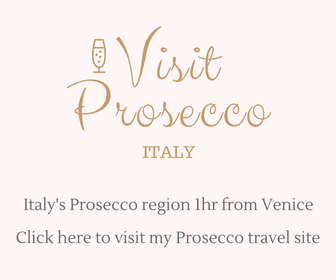 You can sign up to my Visit Prosecco Italy newsletter to get new updates and any special offers delivered to your inbox. Most of us know that Prosecco is an Italian sparkling wine. But did you know that it’s made from the Glera grape and that in order to be labelled Prosecco it must be made from at least 85% glera? Bet you also didn’t know that the other 15% is often made up of grapes you’ve probably already heard of (and drank) like Pinot Grigio and Chardonnay. Prosecco comes in a range of sweetnesses from Brut (dry) to Dry (confusingly the sweetest). You can also get it Col Fondo – which is cloudy with some yeast in the bottle – a style you probably won’t get at home and once which I’m strangely attracted to. But my absolute favourite? Brut zero. With no sugar added, this Prosecco is exceptionally dry (as I like it) and, if you’re saving your calories for Tiramisu (from the Treviso/Prosecco region, by the way), Prosecco zero can be as few as 60 calories per glass. You mcan cancel your gym membership now. You’re welcome. You can learn more about Prosecco here. The short answer is one hour outside Venice in the Treviso region. There is a more complicated answer because there is a town called Prosecco, which is further east in Trieste, closer to the Slovenian border. Although the town of Prosecco is the official birthplace of Prosecco, it’s no longer where the best Prosecco (the ones with the premium DOCG and DOC labels) is found. The best Prosecco is found in the Prosecco hills of Treviso, an hour from Venice. You can find out more the location of the Prosecco region here. I’ve visited the Prosecco region both in Spring and in Autumn and I’d highly recommend both. The weather was perfectly warm on both occasions and availability (accommodation, restaurants, train seats, drivers) was great. Winter is colder but with plenty of Italian carbohydrates for comfort food, winter could make for a beautiful pre or post Christmas trip. Added advantaged: availability will be excellent and you’re more likely to get good travel deals. Summer is going to be peak beauty – sitting on a terrace sipping Prosecco? I’m in. Just book everything early and be prepared to have a love-hate relationship with Venice. I’ve got some tips for getting the most out of your time in Venice here. 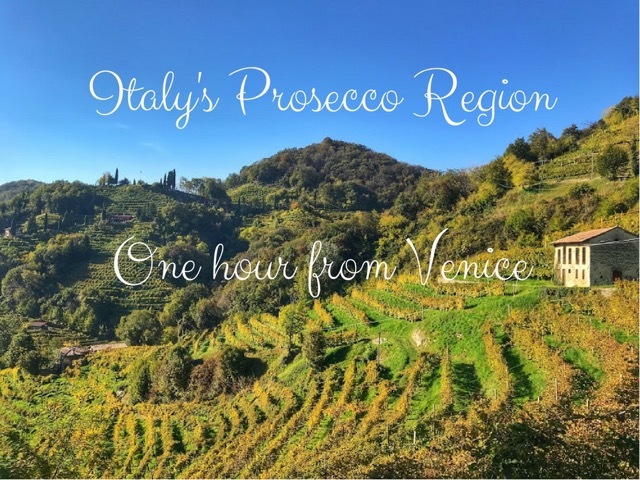 Given the popularity of Prosecco, it’s a surprise to me that there aren’t more and better package wine tours from Venice to the Prosecco region. To visit, you can either book one of the few tours your find through Google or you can take the train from Venice and hire a driver for a few hours instead. I have taken plenty of package tours on my travels but for Prosecco, it’s just as easy and usually much cheaper to book it yourself. You can find out more about how to book your own Prosecco wine tour from Venice here. Why take a Prosecco wine tour from Venice? 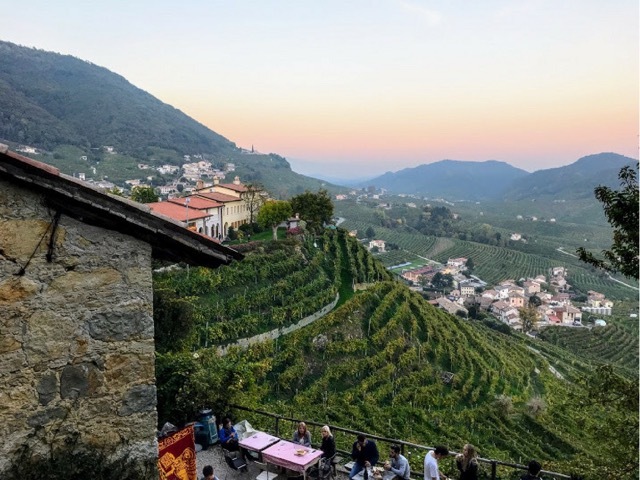 For some strange reason, the Prosecco region hasn’t made a blip on most tourist radars – it will happen, for sure. Visit now before everyone else does. Wouldn’t you rather watch corks popping than glass blowing on a day trip from Venice? Venice is best experienced in small bites – the crowds can be horrific and stepping away to the calm of the Prosecco hills for a day or night will help you enjoy the canal city all the more. 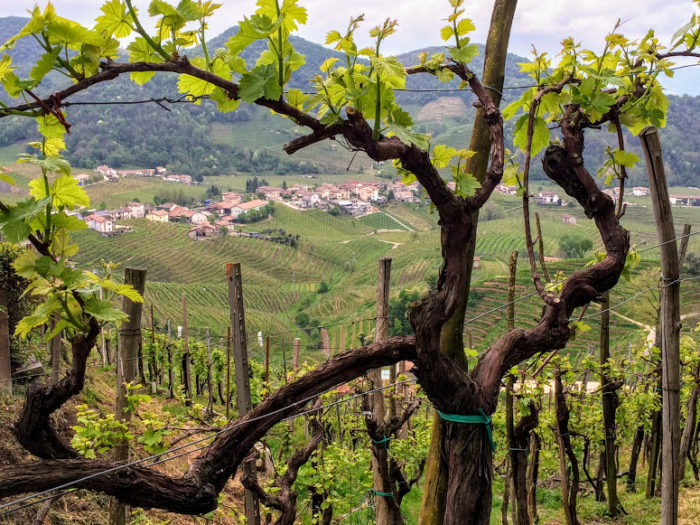 Of all the vineyards in all the world (and I’ve visited a lot), I’ve not seen any with the same steep, dramatic rolling hillsides as you’ll find in the Prosecco region. The region is so beautiful, it’s on the brink of gaining UNESCO World Heritage Site recognition. And then the tourism numbers will surely rocket. I repeat: Go. Go now. 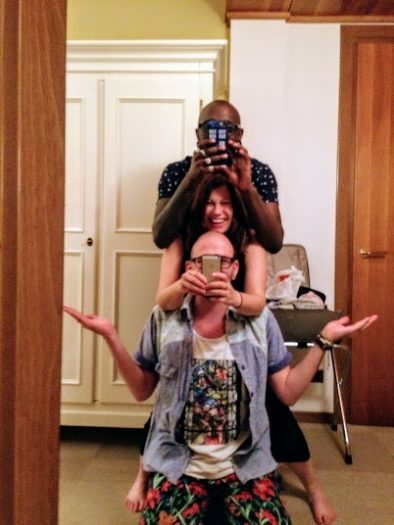 You’re going to have a lot of fun (that picture above may have been taken after me and my travel companions had consumed an impressive amount of Prosecco at the vineyards and, continuing to taste our purchases at the hotel). So, that’s my guide and introduction to my new website on how to plan a self-guided Prosecco wine tour from Venice. 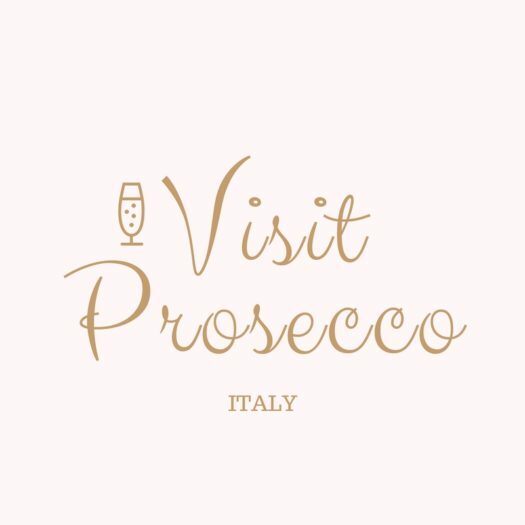 You can follow along with plenty of Prosecco themed fun on my Visit Prosecco Italy Facebook, Pinterest and Instagram pages. 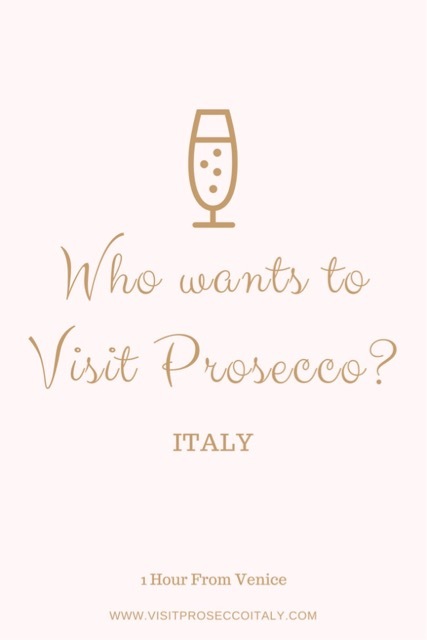 And drop me an email here or over on Visit Prosecco Italy if you have any questions. You can read all about my first trip the Prosecco region here. 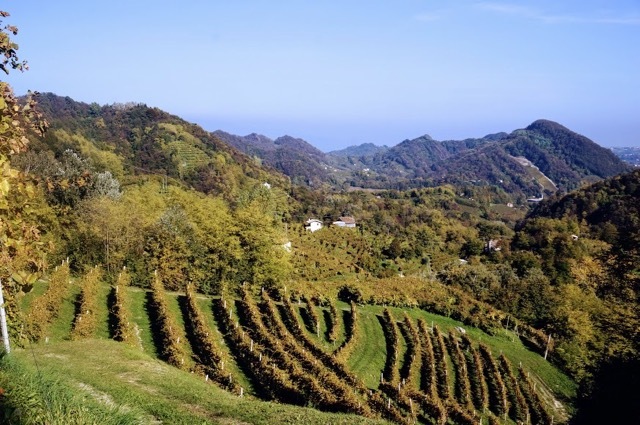 Have you visited the Prosecco region? Got any questions, comments or travel tips? Let me know in the comments below. I want to visit this region and want to drink this amazing wine. I am really fond of tasting some amazing quality of wines and soon I am going to taste it. Thanks for the Information that you have shared. Happy to help. I hope you get there one day. I’m currently in Venice and found your blog. The prosecco area sounds interesting but not sure I want to spend a few hundred Euro’s touring wineries. If I caught the train out is the town area interesting, or more like Tuscany where you really need a car ? Just for the record staying in Canneregio and while my apartment at the foot of the Guglie bridge is in the thick of things, two minutes walk and I am in those quiet spots, amazing really how little of Venice most people see and no wonder so many are dissapointed.will be reading more of your blog now I’ve found you. Hi Cathie, I’m glad you found my Venice post useful. I was there in November and stayed in Canareggio – it’s become my new favourite part of Venice. You can avoid the crowds almost entirely there! As for the Prosecco region, there isn’t much to see in the cities that are reachable by train. While Conegliano is nice enough, it’s still mainly buildings – not the Prosecco hills that make the area worth a visit. You could see about taking a driver or taxi for just an hour to tour around (around €50) but I don’t think that is really enough time to explore – it’s a bit like getting to the garden gate of paradise and not going in! Perhaps save it for another trip? Enjoy your time in Venice and I’m very happy to have found another reader!